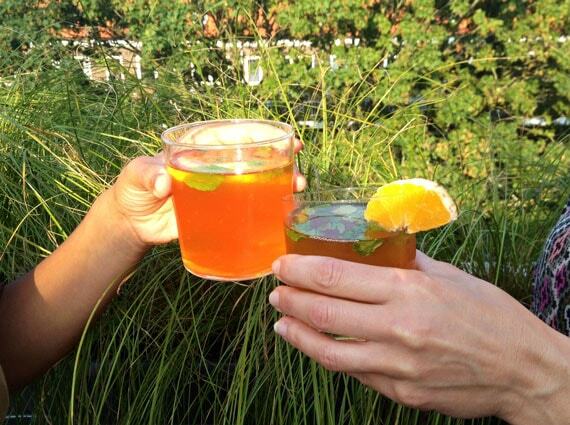 A splash of orange, a hint of mint – we can’t get enough of this refreshing iced tea! There’s been more than a few hot days in the office that would’ve been a lot less productive (not to mention pleasant) without this sweet, energizing beverage. Lucky for us, it’s easy to make and a piece of cake to throw together at work. Since it’s been such a delicious lifesaver for us this summer, we thought we’d pass along the recipe for you to enjoy. Have it at work, at home, at the beach or anywhere else you’d like a cool drink! Combine 7 cups of boiling water and 2 cups of sugar in a pitcher and stir until the sugar is dissolved. Add the tea bags and mint sprigs and let it stand for 5 minutes. Using a slotted spoon, remove the tea bags and mint sprigs. Add the cold water, orange juice and lemon juice. Cover and refrigerate for at least 4 hours (if you can’t wait that long, do what we do and just pop it in the freezer for a bit). Serve the tea with ice, oranges and a few fresh mint sprigs. Throw in a cocktail umbrella and enjoy!